Creative visualization is the key to living the Law of Attraction. Using your mind you can create extremely detailed mental imagery which is an excellent manifestation tool. There are many different visualization techniques, all serving different purposes. Which one you use depends on your personal development goals. So, what are you aiming for in life? Focusing on self improvement and getting to know your inner self? Looking to increase your vibrational frequency? Maybe you're more interested in living a life of optimum success and health. Well you're in the right place. In this post you I am going to teach you how to visualize your way to success. Learning to visualize is the most effective way of mastering your mind and manifesting the life of your dreams. We humans are driven by visual stimuli. Our brains naturally produce an emotional response to images, including mental images. Creating a positive emotional experience inside your mind attracts high frequency events into your life. Here are some visualization techniques for training your mind's eye. Before doing any one of these exercises you must find a quiet, comfortable place away from outside distractions. Get yourself into a deep state of meditation by focusing on your breath and/or counting backwards from 200. Your mind will naturally become quiet as your thoughts fade away. Start by imagining simplified version of your desired scene in your mind's eye and focusing on it for a while. Now, add new objects or details to this scene slowly, object by object, piece by piece. Finally, introduce a person to your scene if you wish to. Well, as many people as you feel you need, without overloading your brain. Grab a piece of fruit. One with a strong smell and interesting texture if you wish to challenge yourself. Now get into a deep state of meditation. When you feel that you have a clear and empty mind, place the piece of fruit in front of you. Examine the fruit closely. Notice the colour of the skin, the texture and smell. Shut your eyes and return to your relaxed state. Make sure your have a clear mind. Now, create a mental image of that piece of fruit with as much detail as possible. Picture the colours, textures, smells, feel of the skin. 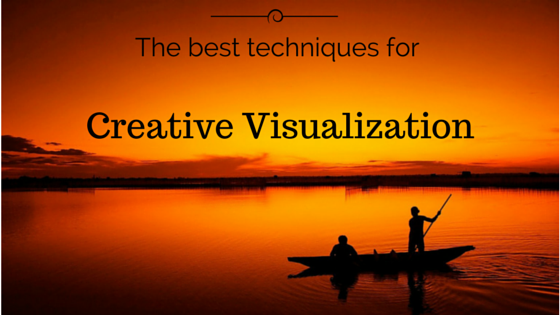 Get your visualized image as vivid and real as your brain can make it. When you feel this exercise is becoming too easy, you should try mentally recalling an abstract object or something high in detail. Eventually you will be able to create images in your head without even having to look at any particular object. This is what you are aiming for. Do not worry about the how and why. Leave that up to the Universe. Just focus on painting a mental picture of what you want. Put all of your focus into creating the most detailed mental imagery you possibly can. Do this frequently and you will start to see results. Dreams become reality when passion and persistence meet. You too can unlock your full potential and tap into unused brain power with the use of mental imagery. By putting what you've learnt in this post into action you can use creative visualization to get what you want in life. What you choose to focus on becomes your reality so be mindful of your thoughts. So, if you're lonely or looking for love then visualize your future husband or wife, if you're unwell you should visualize healing light? Visualize your ideal future. Tell us about your creative visualization success stories in the comments. Subscribe if you would like to know more on this subject. Peace.